Leigh’s tremendously engaging film recreates the life and times of England’s greatest nineteenth-century painter in the final twenty-five years of his life (Turner died in December 1851, aged 76). It is admirably researched and scrupulous in its investigation of the historical and art historical record. Yet Leigh’s quest for visual and verbal accuracy is gently handled and always in the service of a narrative that is insightful, affectionate, and moving. Aged seventy himself, in this film Leigh has claimed to have “turned the camera around on ourselves, we who try to be artists.” And so Mr. Turner is not only about Turner’s final decades—a subject that is also the theme of the exhibition J. M. W. Turner: Painting Set Free , organized by Tate Britain, which makes its way to Los Angeles and San Francisco in the spring and summer of 2015. Mr. Turner is also an elegiac discourse on how artists make art—the practical, social and sentimental dimensions of their creative process. The son of a barber-perruquier and a mentally unstable mother who was committed to an insane asylum when the artist was a boy, Joseph Mallard William Turner was born in Maiden Lane, in London’s Covent Garden, in April 1775. His talent for drawing was acknowledged early on. After a rudimentary education, at age 14 he entered the Royal Academy of Arts as a probationer, exhibited his first watercolor there in 1791, and his first oil painting in 1796. He was received as an Academician in 1802, remained deeply attached to the institution throughout his life, and involved himself in the Academy’s pedagogy and management. (As Professor of Perspective, he was a lamentable lecturer, as the actor Timothy Spall, a peerless Turner, demonstrates). Some of Leigh’s finest scenes involve Turner and his fellow Academicians on Varnishing Day—the three-day period during which members were permitted to add the final touches to their works after they had been installed in the exhibition rooms, but before the public (and the critics) had an opportunity to see them. We are introduced to a group of clubbable, forthright men who are, for the most part, admiring of Turner’s overwhelming talent and domineering personality. When Turner’s fellow landscape painter and rival John Constable exhibited his Opening of the Waterloo Bridge (Tate Britain) in 1832 it was hung next to Turner’s more muted marine painting, Helvoetsluys; – the City of Utrecht, 64, Going to Sea (Tokyo, Fuji Art Museum). To enliven his canvas, Turner daubed a thick circle of red paint smack in the middle of the sea, which he later refashioned into a buoy floating on the water. “He has been here and fired a gun” was all that Constable could say. For his long career Turner was a landscape painter, working in a genre that occupied a relatively modest ranking within the hierarchy of the arts, but one that he considered akin to epic poetry and at the summit of artistic achievement. His compositions, use of color, and technique both as painter and watercolorist were strikingly original. The critic William Hazlitt marveled that “he delighted to go back to the first chaos of the world,” yet his work gained immediate acceptance. Despite the shock of the new in Turner’s art—one wag christened him “the over-Turner”—the artist never lacked for patrons for either his oils or watercolors and was able to reach a wide market through his prints and illustrations (the result of painstaking, often acrimonious joint ventures between Turner and his printmakers). He maintained a gallery of his work for sale in his house at the corner of Harley Street, where his paintings hung on walls of Indian red with daylight entering from a glass roof, filtered through sheets of tissue attached by herring nets. Although taller than the “little Turner,” who stood five feet four inches and had a 35-inch waist, Spall inhabits the gruff, driven artist with uncanny authority. Turner’s domestic life as it unfolds over a quarter of a century provides the principal narrative of Leigh’s film. From the beginning we are presented with the artist’s loving relationship with William senior (Paul Jesson), his “old Dad” who in his mid-50s abandoned his barber’s shop to become his son’s studio assistant and take charge of his household. With the devoted housemaid, Hannah Danby (Dorothy Atkinson)— “Damsel”—always ready to satisfy Turner’s raging if mute carnality, the charmed circle at Harley Street is complete. Far more tempestuous is Turner’s relationship with his former lover, the widow Sarah Danby (Ruth Sheen), and their two illegitimate daughters, whom he refuses to assist in any way. He is silent when informed that his younger daughter Georgiana has died in childbirth, though the clenching of hands behind his back indicates a deep anguish. Turner is more admirable in the company of his enlightened patron George O’Brien Wyndham, 3rd Earl of Egremont (Patrick Godfrey), whose country house at Petworth was a refuge for many artists (Turner had the use of a studio there). Moved by all he sees, and by much of what he hears, at Petworth he is unfailingly respectful towards his host, but without a trace of deference. In the years following the death of his father in 1829, the most significant figure in Turner’s affective life is Sophia Caroline Booth (Marion Bailey), the prosperous widow who offered lodgings in the seaside town of Margate on England’s south-east coast (a popular, if downmarket, resort for Londoners, then as now). Turner had enjoyed the Margate air as a child, and his courtship of this unlikely Dido is handled by Leigh and the actors with complicity and tenderness. The couple cohabited as “Admiral and Mrs. Booth” in Davis Street in World’s End, Chelsea, from 1846 to Turner’s death five years later, even as the artist hid his relationship with Booth from all his London acquaintance. One of the film’s most poignant moments is the visit of the diseased and exhausted Hannah Danby to World’s End. Having discovered her master’s new address, she makes the journey on foot from Harley Street with a companion to set eyes on the little house. Cordially received by neighbors, whose health and respectability are in marked contrast to her own, she becomes too distressed to knock on Turner’s door and returns home without seeing him. Leigh and his cast capture most brilliantly Turner’s constant need to be working: his endless sketching, “sunwatching,” and traveling. Especially riveting—and challenging—are the scenes that show Turner at his easel, attacking canvas and paper with pigment, soot, and spit, applying his colors with brushes, knives, and even, on occasion, his “eagle-clawed fingernail.” Spall, who studied painting for two years in preparation for the role, is thoroughly convincing as the ecstatic and inspired artist; it is only a pity that the stand-ins for Turner’s paintings are such lackluster reproductions. “Keep your corners quiet, center your interest.” In one sense, Turner’s advice has not been followed by Leigh, whose scenes are replete with memorable vignettes of English life of all classes. Whereas Turner’s figures—tiny, distant, incidental—occupy the peripheries of his landscapes, Leigh’s are front and center in many frames. His focus on coiffures and costumes, no less than on faces and expressions, is resolute, unflinching, and humane, as is the film’s celebration of propriety, community, and decency. English society at the dawn of the Industrial Revolution is shown to have been ruddy, healthy and clean: there is no hint of Dickensian squalor in Leigh’s recreation of Turner’s world. 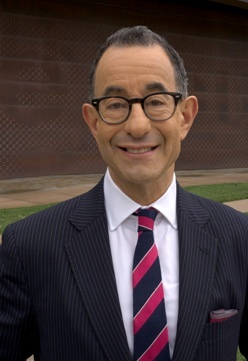 Colin B. Bailey is Director of the Fine Arts Museums of San Francisco—the de Young in Golden Gate Park and the Legion of Honor in Lincoln Park. Prior to his 2013 arrival in California, Bailey served in leadership roles at The Frick Collection in New York, the National Gallery of Canada, and the Kimbell Art Museum in Ft. Worth. A specialist in 18th- and 19th-century European art, Bailey is an avid filmgoer who was pleased to be invited to share his reflections on Mike Leigh’s movie. He looks forward to sharing Turner’s spectacular oil paintings and watercolors with a Bay Area audience in J. M. W. Turner: Painting Set Free, on view at the de Young from June 20 to September 20, 2015. Mr. Turner is now available on DVD from Amazon.com. Listen to Terry Gross’s interview with Timothy Spall about his career and his preparation for Mr. Turner. Click here for a look at how Mr. Turner recreates the 19th century Royal Academy. Click here to see Mike Leigh discussing the challenge of translating J.M.W. Turner’s life and work into cinema. This entry was posted in Films, Films: Reviews and tagged Colin B. Bailey, Film, film review, Films, J. M. W. Turner, Timothy Spall. Bookmark the permalink.